The Netatmo Welcome is a perfect example of using technology to benefit the end user rather than just adding another feature to the spec sheet. It's a fantastic bit of kit that provides the security features a smarthome camera should offer, without intruding on those that are welcome in your home (no pun intended). Smarthome cameras are funny things, always on and always watching. Some love the idea of them, while others are less keen – and we can understand why they divide opinion. It's that thought of being spied on by parents, partners or family members. Of course the underlying idea of the Netatmo Welcome is home security, as it's able to alert you via a smartphone app to any abnormal activity that is taking place in your home when you aren't there. In the same breath it allows you to remotely check on your home and see whether the pets are running riot. But what sets this Netatmo camera apart from the competition is that it can also recognise faces and allow you to customise who it records and who it doesn't. Just how well does this work? We've been living with the Welcome for just over a month to see whether it does everything a smarthome camera should, minus the excessive intrusion. There are several smarthome cameras available on the market – from the Withings Home to the BT Smart Home Cam – and the Netatmo Welcome puts design first. As far as smarthome cameras go, it's up there as the beauty queen, considerate of the fact it will be on constant display. Or, like in our setup, discreetly tucked away in among candles and decor. An anodised aluminium gold casing makes up the majority of the device, featuring cut-out sections for the Micro-USB power port, Ethernet and microSD slot at the rear of the camera. The casing also breaks at the front for the lens and the infrared LED. The only unavoidable downside is that it needs a power cable, which consequently restricts where you can place it. Setup for the Welcome is quicker than eating a piece of cake, literally. It took us no more than five minutes from taking it out of the box to it alerting us to an unknown face (fortunately, at that point in time, that was our face, not some randomer hiding behind the curtains). Netatmo has been clever, as rather than you having to enter all your Wi-Fi information the Welcome will use the configuration from your phone. You just have to turn the device upside down in order for it to pair with your phone, which might seem a little random, but makes sense as you have to be physically present in order to initially connect. During setup, the smartphone app will give you a few tips to ensure you get the best from Welcome, such as avoiding backlight, or utilising notifications and location services. It's worth saying yes to both of these features as the app uses the information to know whether you are home or not to determine which notifications it sends you. More on that later. Additional users can be setup in the Settings section, where you can also rename the Welcome camera here – we called ours Jon Snow, obviously. The Welcome camera doesn't have quite as many features as the likes of the Withings Home camera, but its facial recognition is something all its competitors lack. That makes alerts less frequent and, therefore, the experience is less intrusive overall. In order for the facial recognition to work properly, the Welcome needs to be taught who is who. Profiles have to be created for each person you want the camera to recognise so as friends and family visit you can slowly make profiles for each of them. The reason we say slowly is because the Welcome, understandably, wants to see a face several times and from various angles before it is accurate, so each person will need to visit your home a couple of times before all five sections of their profile will turn green. Each time the Welcome thinks it has recognised someone with a profile, the app will ask you to validate all the faces it thinks is them and reject the ones that aren't, using your selections to continuously build the profile for each person until it is satisfied it will recognise them from every angle. Any backlog of faces awaiting validation can be found in the options menu of the app under Teach Faces To Welcome. It is worth checking here every now and then just to make sure the Welcome knows as much as it can in order to make it more accurate. As the camera sees people, a circular thumbnail of a face will appear in the drop-down section of the app. This section is accessed by clicking on the small arrow that sits on top of the image on the opening screen of the app. For every unrecognised face, or unknown face as the Welcome calls it, a small green circle appears in the top right of their thumbnail with a question mark in it. Clicking and holding on the question mark will bring up three options – Identify, Forget and Not A Face. The Identify option will allow you to tag that unknown face to an existing profile, or create a new profile, while Forget and Not A Face will get rid of the thumbnail from the section altogether. Our Welcome camera is positioned on the windowsill in our living room meaning it's able to see our TV, which therefore means it picks up lots of unknown faces – from Jeremy Clarkson to the cast of Love Island. If a certain number of unidentified faces appear then the app will group them into one thumbnail, which can be opened and flicked through at pace to make sure there isn't anyone that should have been recognised in there. The facial recognition technology also allows you to customise each saved profile. Pressing and holding on the person's profile you wish to customise will pull up two options – edit and forget – meaning along with customising, you can also delete profiles. The edit option launches into the specific profile and offers a range of settings. Firstly, you can add a picture of the person from your photos or import it from your contacts. If you choose not to do this, the Welcome will use the first image it captured of that person (which isn't always the most flattering). There is a toggle that can be turned on for when the profile you are customising is yourself. This means the Welcome uses your smartphone's location to determine when you have left home and when you return if it doesn't see your face to verify. This was useful for us as we were unable to have our Welcome by the front door due to a lack of power socket and we didn't always go into the living room when arriving home late. Secondly there are individual notification settings for each profile. Within these settings you can choose whether to be notified about a particular person's arrival and within what specified time frame. For example, you could set it to notify you of your child's arrival between 15:00 and 17:00 so you know when they have returned from school, but not each time they go in and out of the house. Last but certainly not least are the video recording settings. There are three options – Never, On Arrival, and Always. These are quite self explanatory, offering a level a privacy that is not available on other smarthome cameras. Not everyone is comfortable with being filmed and chances are your kids or friends wouldn't appreciate it if they knew they were in the equivalent of the Big Brother house. We use the On Arrival setting more so than the others. The Welcome then lets us know when our partner is home from work but it won't record them after this. Selecting Always will record videos of varying lengths, normally between two and six minutes, consisting of the time before the person seen arrives and a short period of time after. When it comes to notifications, the Welcome is clever here too. Within the options section of the app you can perform a range of functions, from turning the Welcome camera off entirely through to customising notifications. There is an option to select Empty Home, which tells the Welcome everybody has left, defaulting it to the highest alert level. But you can also set various parameters for notifications in the Adjust Welcome To Your Needs section. For known people with saved profiles it's possible to set a time limit for when they should be considered away, utilising a scale ranging from one hour to 12 hours in 15-minute increments. Unknown faces are always recorded and there is no way of altering that unless you turn the camera off altogether, but you can choose when you want to be notified about them. We opt for only when nobody is at home, rather than always, as we didn't want constant notifications coming through. For motion detection there are two options, both of which have three choices. The first refers to whether you want motion to be recorded, which we set to only when nobody is home in order to save space on the microSD card (but you can choose never or always). The second option refers to notifications of motion, which we set to only when nobody is home again to reduce notifications (again, never and always are also choices). The Welcome camera has the ability to record Full HD 1080p video and it performs reasonably well overall. There is a delay of between 10 and 12 seconds between something happening and it appearing on the live feed, when watching over the same Wi-Fi network, which is quite a bit longer than competitors. It's only possible to record onto the microSD card on board too, as cloud storage is not available (only key still frames are stored). That saves on subscriptions fees, which is a positive, but could be a limitation at the most critical of moments. Without the ability to live record via smartphone, and without said cloud storage backup, what's to stop a potential intruder stealing the Netatmo and all the security footage therein? Nothing. Sure, the microSD card is encrypted, but if it's gone then it's gone. However, you can download successfully recorded videos from the Welcome to your smartphone over a network, which is certainly handy. Sometimes the Welcome also gets people mixed up, so its recognition isn't quite perfect. It has mistaken our partner for a member of the Pocket-lint team that we set a profile up for a couple of times and while we see no similarities, the Welcome obviously does. It is possible to teach it that it got it wrong though, by pressing and holding on the event within the feed below the live image recording. In terms of picture quality, the Welcome gives you a clear, crisp image and the sound picked up from the built-in microphone also does a good job. Night vision is also decent, delivering a distinguished image, despite the image taking a couple of seconds to render. The Welcome offers a 130-degree field of view, which isn't as wide-angle as the Withings Home, for example, and the Welcome doesn't allow you to zoom in or pan around like the Withings does either. A poor internet connection will cause the Welcome's performance to deteriorate too. Getting a live feed is almost impossible and you can forget downloading any recorded videos – but this is the case for the majority of smarthome cameras. As long as you have Wi-Fi or a good connection, the Netatmo Welcome performs well. 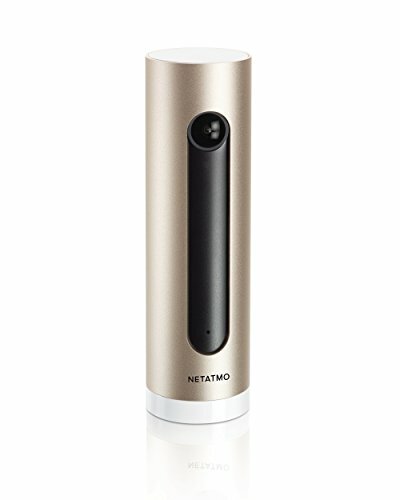 The Netatmo Welcome is among the best smarthome cameras we have had the pleasure of spying on us. It has a beautiful design that integrates well into the home, but it's the facial recognition technology that really won us over. It's main letdown is a lack of cloud backup. Now, while that's great for ongoing fee-free use, it means that if the device is disconnected it can't send video clips to your smartphone – so if it's stolen then so too is your microSD-based evidence. Compared to the rest of the market, the Welcome isn't quite as feature-rich. Take the Withings Home, for example: by comparison the Netatmo lacks panning and zooming, doesn't double-up as a nightlight, nor can it be used to speak through via the smartphone app. But we'd certainly take its facial recognition feature over the ability to function as a nightlight, sing a lullaby, or monitor the air quality. For the right home, the Netatmo Welcome is a clever addition to ensure the kids get home safe, the babysitter is still awake, or the pets aren't running wild. It does more than you'd expect from many smarthome cameras, with less intrusion and the potential for fewer alerts – and all without the extra monthly charges of many cloud-based competitors.